The moment TREM2 was pinned as an AD risk factor (see Nov 2012 news), researchers started hustling to understand how this receptor, which is expressed primarily on microglia in the brain, exerts its sway. The discovery that variants linked to neurodegenerative disease appear to sap the protein’s function strongly suggests that TREM2 plays a broadly beneficial role, either in staving off disease onset or slowing progression. However, animal models of disease have painted a complex picture, revealing that TREM2 can evoke both helpful and harmful responses from microglia (see image, right). Which type of response predominates varies across both disease models and disease stages. Initial studies, which focused on TREM2 in microglial clearance of Aβ plaques, showed that the receptor’s role could be dramatically different from one mouse model to the next, and now scientists are seeing equally variable behavior among tauopathy models. At Keystone, Cheryl Leyns from David Holtzman’s lab at Washington University in St. Louis presented a poster implicating TREM2 in exacerbating neurodegeneration in the PS19 tauopathy model. Published last year, her data blamed TREM2 for inciting harmful microgliosis and neuroinflammation in these mice (Leyns et al., 2017). However, Bruce Lamb’s lab at Indiana University School of Medicine in Indianapolis reached the opposite conclusion using hTau mice, in which tauopathy progresses more slowly. In those animals, TREM2 reduced accumulation of hyperphosphorylated tau and prevented neuroinflammation (Bemiller et al., 2017). TREM2 discoverer Marco Colonna of Washington University in St. Louis, who collaborated with Leyns and Holtzman, told Alzforum that together, the findings support the idea that microglia respond in proportion to the aggressiveness of threats they encounter (see Oct 2017 news). In severe disease models, such as PS19, microglia react strongly and may harm neurons. In milder models, such as hTau, microglial meddling may prove beneficial. Either way, TREM2 supports microglia in their endeavors, Colonna said. The findings suggested that TREM2 helps microglia slow the seeding of new plaques, but how? Haass reported that plaques in seeded wild-type mice contained about double the ApoE as those from seeded TREM2 KO or T66M-TREM2 mice. In line with what previous studies have reported, Haass also found that TREM2 facilitated increased ApoE expression in microglia in seeded wild-types, but not in animals lacking functional TREM2. He proposed that microglia clustering around plaques might infuse ApoE directly into the deposits. In support of this idea, Haass found that depleting microglia from the mouse brain dramatically reduced the amount of ApoE in plaques. Perhaps ApoE aids in the compaction of plaques, which could explain the striking observation made by several labs that plaques in TREM2-deficient mice are larger and more diffuse. Such “fluffy” deposits might be more apt to leach toxic Aβ oligomers than highly compacted versions, some researchers at Keystone speculated. Holtzman collaborated with Haass on this work. He favors the idea that another cell, astrocytes—the prime source of ApoE in the brain—are the major contributors of plaque-associated ApoE. Astrocytic ApoE likely facilitates the earliest stages of plaque seeding, which occurs long before microglia arrive at the scene and start pumping out ApoE themselves, Holtzman said. Colonna commented that while it is possible microglial-derived ApoE enters plaques and helps compact them, other TREM2-mediated microglial functions, such as barrier formation, might achieve a similar effect (Wang et al., 2016; Yuan et al., 2016). Either way, the data strengthen the prevailing view that TREM2 helps microglia limit Aβ plaques, he said. In his talk, Oleg Butovsky, Brigham and Women’s Hospital in Boston, set the stage for a flash of provocative new data. In recent years, Butovsky uncovered a homeostatic gene-expression signature in microglia under healthy conditions. In the face of neurodegeneration, TREM2 helps transform homeostatic microglia into a so-called microglia neurodegenerative phenotype, a.k.a. MGnD. These activated cells upregulate expression of ApoE, among other genes (see Feb 2015 conference news, Sep 2017 news). Whether this switch is helpful or harmful likely depends on the type of pathology, as well as disease stage, Butovsky contends. Butovsky suggested that in the SOD1-G93A model, TREM2 somehow bestows MGnDs with the ability to cry out for help—in other words, to secrete cytokines that recruit peripheral macrophages. Strikingly, the presence of these “infiltrating” cells correlated with longer survival. The data are still preliminary, Butovsky said. If true, they would suggest that recruitment of peripheral cells is a critical function of late-stage MGnD. Similar phenomena could play out in other neurodegenerative diseases, such as AD, Butovsky said. At first glance, this might seem to fly in the face of findings from parabiosis experiments led by Holtzman and Colonna, in which peripheral cells did not infiltrate the brain in AD mouse models of amyloidosis (Wang et al., 2016). However, Colonna acknowledged that while the results of those parabiosis experiments were crystal clear, they were also limited. For example, the researchers could only keep animals conjoined for two months, leaving open the possibility that peripheral cells infiltrate later in disease. Colonna has not tried parabiosis in SOD1-G93A mice. When it comes to subtypes of microglia found in brains stricken with neurodegeneration, MGnDs aren’t the only game in town. Consider the disease-associated microglia, or DAMs, reported by Michal Schwartz and Ido Amit of the Weizmann Institute in Israel, as well as several other subtypes described by Li-Huei Tsai of Massachusetts Institute of Technology (Keren-Shaul et al., 2017; Mathys et al., 2017). At Keystone, both Amit and Tsai reviewed published findings on this issue. Both researchers used single-cell RNA sequencing to monitor transcriptionally distinct clusters of microglia as their gene-expression patterns shifted during disease progression. Overall, Amit and Tsai drew roughly similar conclusions as Butovsky in regard to gene-expression changes incited by neurodegeneration, such as microglial upregulation of ApoE, but they also reported that these changes occurred in distinct temporal waves as disease progressed. Notably, in the case of DAMs, the transformation from homeostasis to disease-associated phenotype occurred in two stages, only the second of which was TREM2-dependent. 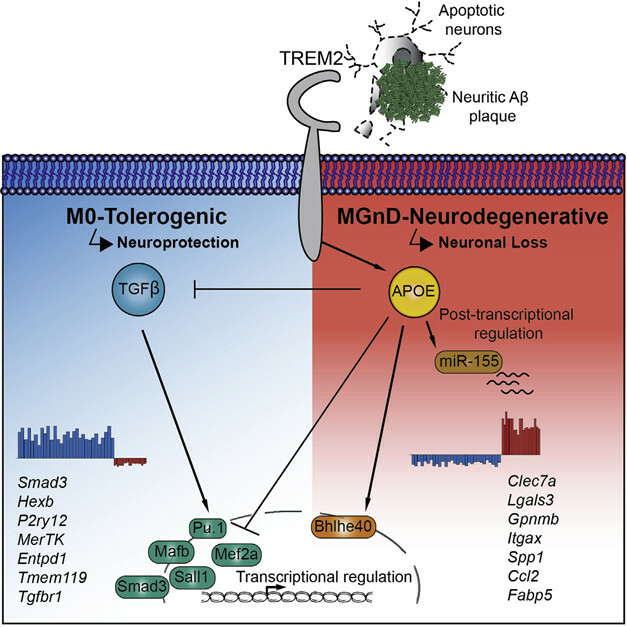 Collaborating with Colonna, Amit reported that in TREM2 KO 5xFAD mice, microglia did transform into Stage I DAMs—characterized by reduced expression of homeostatic genes and upregulation of ApoE. But from there, the cells did not progress further into Stage II DAMs, which additionally express genes involved in phagocytosis. If TREM2 doesn’t kick off the whole DAM cascade, what does? Fielding this question from the audience, Amit hinted that he was closing in on a culprit, but shared no more. Researchers at Keystone also left the familiar territory of mouse models behind to study human microglia, finding a more nuanced repertoire of cells in the human brain. Last but not least, TREM2 is also a receptor in its own right. Its long list of ligands includes ApoE, Aβ, and lipids (Wang et al., 2015; Zhao et al., 2018). 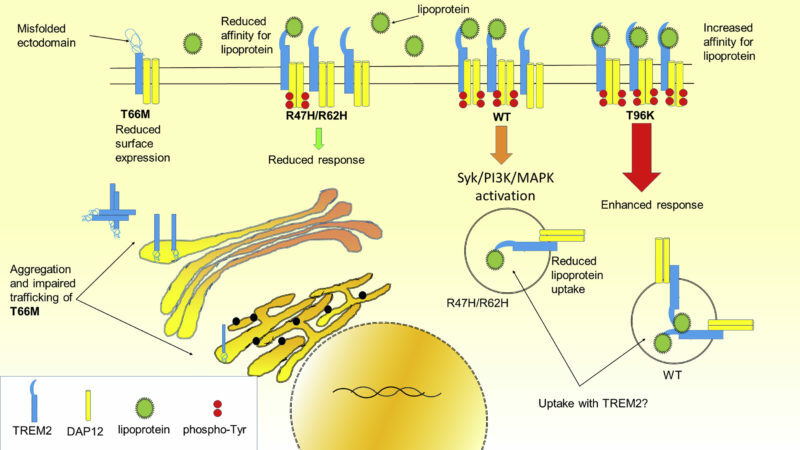 At Keystone, Colonna surveyed recently published findings implicating soluble TREM2—the extracellular portion of TREM2 shed by ADAM proteases—as a ligand for neurons. In 5xFAD mice expressing human TREM2, he found sTREM2 blanketing the cells in the vicinity of Aβ plaques. Surprisingly, however, sTREM2 coated neurons whether or not they appeared healthy. This contradicts the prevailing view in the field, namely that, at least for full-length TREM2, the receptor specifically latches on to plasma membranes of apoptotic cells. Colonna reported that sTREM2’s coating of neurons was greatly reduced in mice expressing the R47H AD risk variant of TREM2 (Song et al., 2018). Because sTREM2 latched onto healthy neurons, Colonna proposed that sTREM2 might serve as a sensor of lipid density more broadly. Around plaques, lipid density would be quite high, as lipids from plaques, healthy and dying neurons, and glial cells comingle. Exactly how sTREM2’s binding to these elements steers microglial responses is unclear, but Colonna intends to find out. In keeping with this general theme of lipid sensing, a new study reported that AD risk variants near the gene coding the fatty acid sensor family MS4A correlate with levels of sTREM2 in the CSF (Deming et al., 2018). Keren-Shaul H, Spinrad A, Weiner A, Matcovitch-Natan O, Dvir-Szternfeld R, Ulland TK, David E, Baruch K, Lara-Astaiso D, Toth B, Itzkovitz S, Colonna M, Schwartz M, Amit I. A Unique Microglia Type Associated with Restricting Development of Alzheimer’s Disease. Cell. 2017 Jun 15;169(7):1276-1290.e17. Epub 2017 Jun 8 PubMed. Wang Y, Cella M, Mallinson K, Ulrich JD, Young KL, Robinette ML, Gilfillan S, Krishnan GM, Sudhakar S, Zinselmeyer BH, Holtzman DM, Cirrito JR, Colonna M. TREM2 lipid sensing sustains the microglial response in an Alzheimer’s disease model. Cell. 2015 Mar 12;160(6):1061-71. Epub 2015 Feb 26 PubMed. Ulrich JD, Ulland TK, Colonna M, Holtzman DM. Elucidating the Role of TREM2 in Alzheimer’s Disease. Neuron. 2017 Apr 19;94(2):237-248. PubMed.